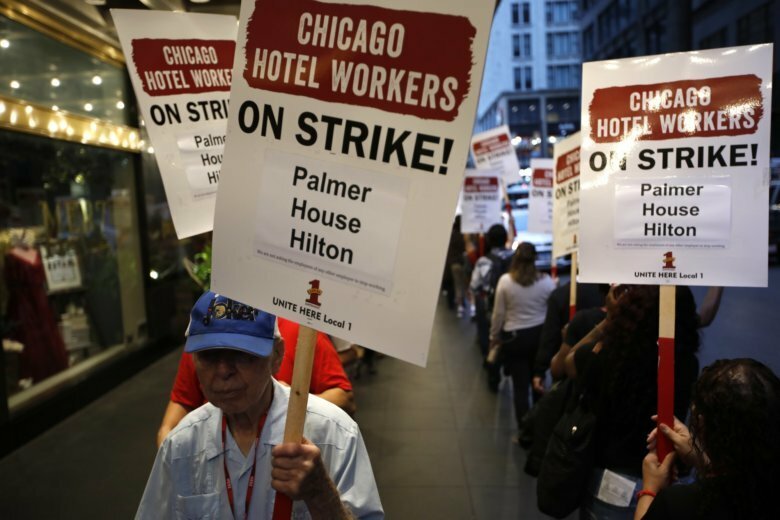 CHICAGO (AP) — Striking Chicago hotel workers spent a fifth day on picket lines as the walkout grew to 26 downtown hotels. Some visitors say hotels have scrambled to clean rooms and check in guests. The strike has targeted large chains including Hyatt, Hilton and Marriott. The Chicago Tribune reports employees at the Cambria Chicago Magnificent Mile joined the strike Tuesday. A main demand of the hotel workers’ union, Unite Here Local 1, is for year-round health insurance for employees laid off during slower months. Hilton says it’s negotiating in good faith for a new contract.